A Physical Disability is when an individual has Little or No mobility. Individuals may have a lack of stamina because of this. Individuals will usually have upper or lower limb loss. Many people are born with a Physical Disability, where as others may aquire it through an accident or developing some sort of degenerative disorder. Individuals may have feelings of depression, anxiety, anger, frustration, low self esteem and may display behaviour that challenges. Not being as independent as you once were, or as your friends and family members are, can leave you feeling upset. Feelings of isolation can occur when the individual sees that others are doing things that they physically cannot. Family and friends may feel guilty for doing or telling the individual things that they cannot do because of their disabilities. Some loved ones may feel protective other the individual, and because of this may feel frustrated with people outside their circle of friends and family. Carers may find the individuals can display behaviour that challenges. Injuries can occur to the individual and Carers through using incorrect moving and handling equipment and practices. We view no one superficially and we believe that all people should be entitled to equal opportunities, have the right to experience life as they wish to. 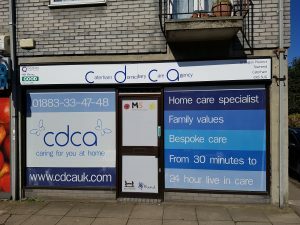 Our CDCA Team understand the importance of individuals maintaining their independence as much as possible. Our CDCA Team Members are highly trained in Moving and Handling. Our CDCA Team Members have regular training in our very own CDCA Training Centre from our highly qualified Trainers. We try to put ourselves in the shoes of our services users, and what they may be experiencing, what they wish to do and the needs they may require.